JNF is thrilled to announce the addition of Dr. Aditya Pandey to their Medical Advisory Board. Aditya S. Pandey, M.D. achieved his Bachelors of Science in Biological and Engineering Sciences from the Washington University in St. Louis and then completed his Doctorate of Medicine from Case Western Reserve University School of Medicine. He then gained training in neurological surgery with sub-specialty training in microsurgical and endovascular treatment of cerebrovascular disorders. Dr. Pandey specializes in treating individuals who have blood vessel related diseases of the brain and spinal cord (e.g., aneurysms, AVM, stroke, fistulas, cavernomas, etc.) as well as practices general neurosurgery (spinal disorders, brain tumors, and traumatic brain injury). He is one of two neurosurgeons in the Ann Arbor region who are trained to perform both open surgeries and endovascular radiological procedures when treating brain blood vessel related diseases. His research interests are aimed at developing and improving tools to assist in the fight against stroke and brain aneurysms as well as understanding early brain injury after a hemorrhage. He has been the author of more than 70 research publications as well as participated in numerous national research trials aimed at improving techniques of aneurysm treatment. Dr. Pandey is currently leading a study to better understand whether a patient requiring aneurysm treatment should be maintained on seizure medications post-surgery. In addition, he is a co-investigator for the HEAT, FEAT, and MISTIE III trials. 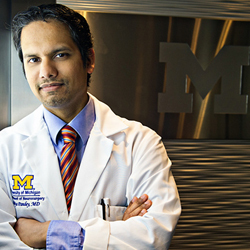 Dr. Pandey has led a multidisciplinary effort in guiding the accreditation of the University of Michigan Stroke Team as a Comprehensive Stroke Center. He currently serves as the surgical director of the Comprehensive Stroke Center.